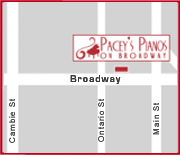 Pacey’s Pianos has always been part of the Vancouver community. Throughout the years, we have helped hundreds of community based charities and non-profit organizations anyway we can. Everyone should have the gift of music in their lives. By donating pianos free piano rentals and many piano services, we have contributed hundreds of thousands of dollars through our donation programs. We understand buying a piano is a big decision. Our years of experience ensure all our customers to make informed decisions that are right for them, their family and their budget. At Pacey’s Pianos, we make buying a piano more than just a purchase. Our staffs are there to guide you and hope to make your visit, enjoyable and rewarding. We’ll talk through the different choices and guarantee that you will completely be satisfied with your new piano or keyboard. We’re always available to answer any questions and to assist you in every way possible.